As i mentioned already in the earlier post the Guidelines to the Perfect Impression this post is just an addition where the precautions to be taken are given in a different was so that it is easy for the Dental assistant and the Clinician to get a perfect dental impression. Apply the correct adhesive to all internal surfaces and perimeter of the impression tray and let dry. Express a small amount of material from the auto mix cartridges before placing the tip. Keep the tip of the syringe buried in the expressed material during loading to minimize bubbles. Pay strict attention to working time. Viscosity increases with time reducing flow and detail production. Working and setting times are shorter in higher temperature and humidity. Select a tray of adequate size and extension. Provide occlusal stops if needed. Seat the loaded tray in a timely fashion. Once the material becomes rubbery, movement of the tray will cause internal stresses leading to an inaccurate impression. 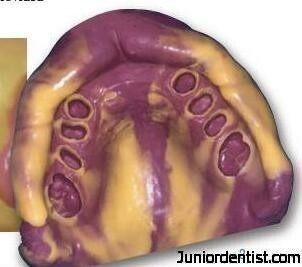 Removal of the impression too early will cause significant distortion. If using a closed-bite tray, be careful to avoid burn-thru, which can create distortion of the impression and produce less than ideal final restorations. If these tips are followed along with the Guidelines to the Perfect Impression thoroughly then you are assured to get a Perfect impression which will make you go one step closer to getting a perfect Denture.